Last weekend was the RSGB Centenary Convention at Horwood House just outside Milton Keynes, the convention is a great time not only to do some socialising but furthering your knowledge within the hobby which is never a bad thing! This year I was once again asked if I’d do another follow up talk on the Raspberry Pi, after a quick bit of Twittering came up with the name Another Slice of Pi. I have to admit I’m always slightly worried that no one would turn up but on both days my session was near enough full which is always a nice. Saturdays session I had the pleasure of having Eben Upton sat in the audience, afterwards I put on social media that I thought that it was probably more nerve-racking than sitting a university exam! however had a really nice chat with Eben afterwards about using the Pi within amateur radio. Most notable talk I went to was by Joe Taylor (K1JT) the creator of the weak signal digital modes, which provided an interesting insight to the modes, I also attended a presentation by Ofcom on their future ideas on changes to the licence regulations which seemed to mostly be a need to tidy up the lifetime licence as it was poorly written. 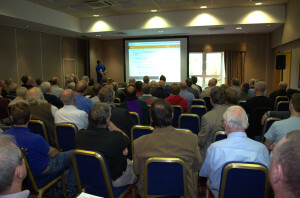 The final presentation I attended was by Mike G7VJR on Easter Island – XRY0G which was fascinating.